I loooove gingerbread. 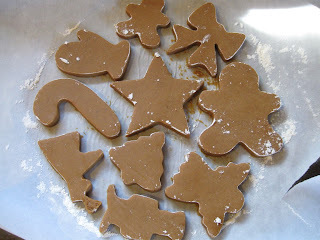 We made gingerbread cookie cutouts this weekend. Some of them are actual gingerbread men but we made several others including angels, mittens and doves. 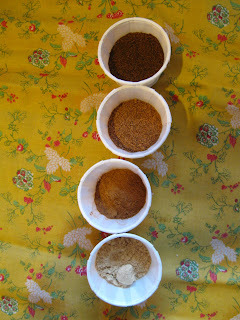 The spices used fill the kitchen with the ultimate Christmas aroma. I rolled them out thick, like 1/4 inch, and baked them on parchment paper. It worked out really well. 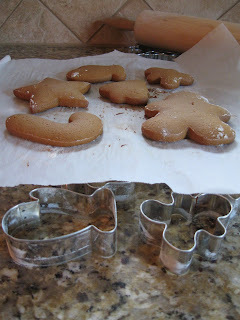 The key to making cookie cutouts is making sure the dough is thoroughly chilled. The recipe I used said to place the cut out raw cookies in the freezer for 15 minutes before baking. Cookies should normally be cooled on racks meant for that purpose but I don't own any so today I invented a new way to cool them: pull the entire sheet of cookie-topped-parchment paper off the pan and place on top of the cookie cutters. Yes! I was happy with this idea and thought myself a regular genius. After they cooled, I decorated some with simple royal icing. We will decorate the rest tomorrow, Raquel and I. She's gonna have a blast! I think I'll put on my old Christmas records while we do it. I got to eat one! YAY! 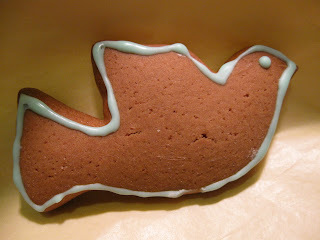 Love gingerbread cookies too! Keep up the good work!